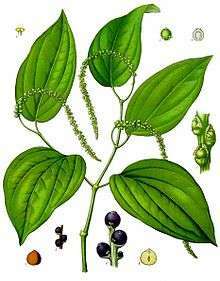 The Piperaceae, also known as the pepper family, are a large family of flowering plants. The group contains roughly 3,600 currently accepted species in 13 genera. The vast majority of peppers can be found within the two main genera: Piper (2000 species) and Peperomia (1600 species). Members of the Piperaceae may be small trees, shrubs, or herbs. The distribution of this group is best described as pantropical. The best-known species is Piper nigrum, which yields most peppercorns that are used as spices, including black pepper, although its relatives in the family include many other spices. The name Piperaceae is likely derived from the Sanskrit term pippali, which was used to describe long peppers (like those of Piper longum). The APG III system of 2009 recognizes this family, and assigns it to the order Piperales in the unranked clade magnoliids. The family consists of five genera: Piper, Peperomia, Zippelia, Manekia, and Verhuellia. The previously recognised Pacific genus Macropiper, was recently merged into Piper. A tentative cladogram showing relationships based on Wanke et al. (2007) is shown below. This phylogeny was based on 6000 basepairs of chloroplast DNA. Only recently has it become clear that Verhuellia is sister to the other four genera in the family. Members of pepper family are small trees, shrubs, or perennial or annual herbs. Plants are often rhizomatous, and can be terrestrial or epiphytic. The stems can be either simple or branched. Leaves are simple with entire margins, and are positioned at the base of the plant or along the stem, and can be alternate, opposite, or whorled in arrangement. Stipules are usually present, as are petioles. The leaves are often noticeably aromatic when crushed. Inflorescences (in the form of spikes) are terminal, opposite the leaves, or located in the axils. Flowers are bisexual, with no perianth, each flower is subtended by a peltate bract. Stamens are 2-6, and hypogynous, with 2-locular anthers. There are usually 3-4 stigmas attached to a single pistil per flower, which is 1 or 3-4 carpellate. The ovary is 1 locular, and superior. Fruits are drupelike, with a single seed per fruit. The seeds have a minute embryo, and mealy perisperm. 1 2 Angiosperm Phylogeny Group (2009). "An update of the Angiosperm Phylogeny Group classification for the orders and families of flowering plants: APG III" (PDF). Botanical Journal of the Linnean Society. 161 (2): 105–121. doi:10.1111/j.1095-8339.2009.00996.x. Retrieved 2013-07-06. ↑ Ravindran PN. 2000 Black Pepper, Piper nigrum. Harwood Acadiic, Amsterdam, The Netherlands. 553 p.
↑ Wanke, S., Jaramillo, M.A., Borsch, T., Samain, M.-T., Quandt, D., and Neinhuis, C. (2007) Evolution of Piperales—matK gene and trnK intron sequence data reveal lineage specific resolution contrast. Mol. Phy. Evol. 42: 477-497. ↑ Wanke, S., Vanderschaeve, L., Mathieu, G., Neinhuis, C., Goetghebeur, P., and Samain, M.S. (2007) From Forgotten Taxon to a Missing Link? The Position of the Genus Verhuellia (Piperaceae) Revealed by Molecules. Annals of Botany, 99: 1231-1238. ↑ Samain et al. (2010) Verhuellia is a segregate lineage in Piperaceae: more evidence from flower, fruit and pollen morphology, anatomy and development. Annals of Botany, 105.